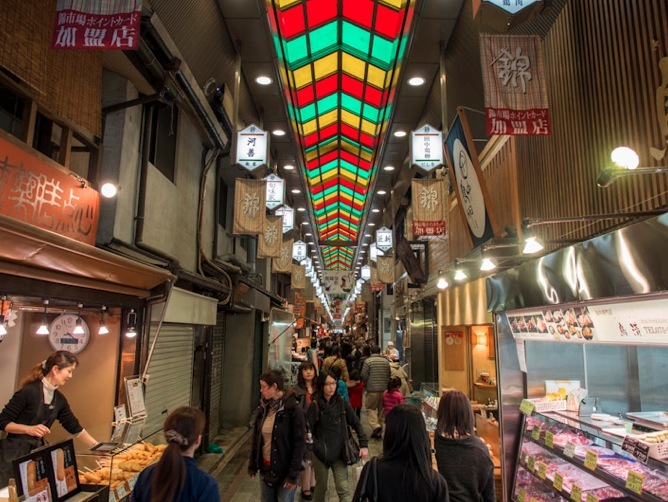 Nishiki Market is a narrow, five block long shopping street (conveniently covered for the rain – given that we were not so lucky with the weather) lined by more than one hundred shops and restaurants. It known as ‘Kyoto’s Kitchen’ and our guide book said ‘f it can be eaten, it can be found here’ – which is completely right. Although its present form and location is from the late 16th century, the market has been in place since the Middle Ages. 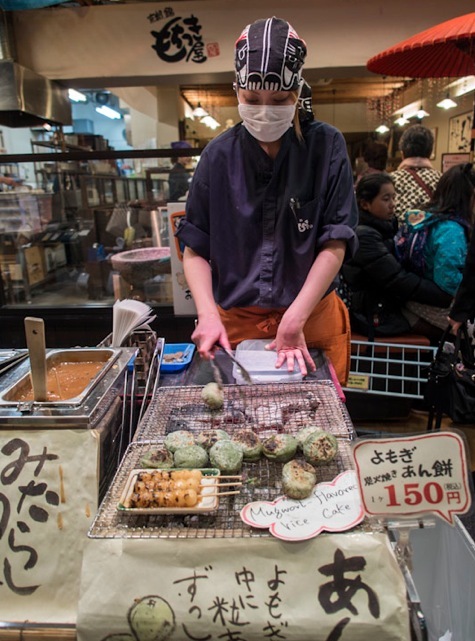 Some of the vendors have been doing business for centuries and generations of Kyoto residents have been their loyal customers. Nishiki is about 390 meters long and runs east-west, from Teramachi Street to Takakura Street. Most of the tiny storefront shops are open by mid-morning, although professional chefs frequent the fish purveyors early to pick the best of the day’s catch. By lunchtime, the market is in full swing and mouth-watering aromas and mind-boggling sights await at every turn: Gleaming raw fish on ice, perfectly rolled golden omelettes, succulent teriyaki grilled fish and the fragrance of roasted tea – all converge to entice the locals and bewilder the traveler. 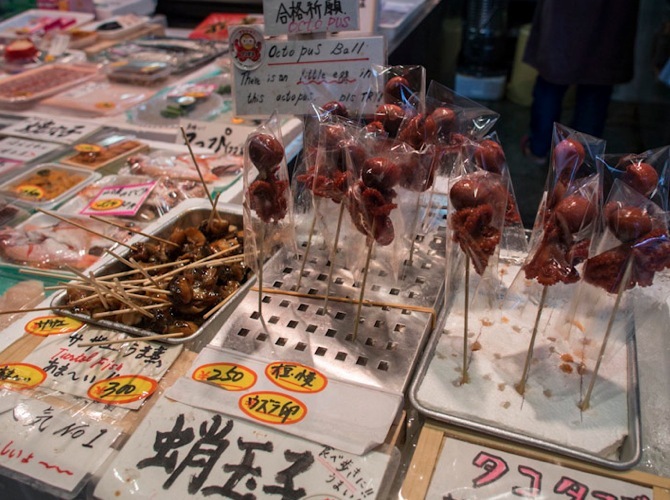 Unlike department stores, almost everything you will find at Nishiki is locally produced and procured. Food is not the only thing for sale: utensils, dishes and clothing are also available. Almost all the necessities of daily life can be found along this narrow stretch. Restaurants, noodle shops and tea and coffee houses also provide nourishment for the hungry. 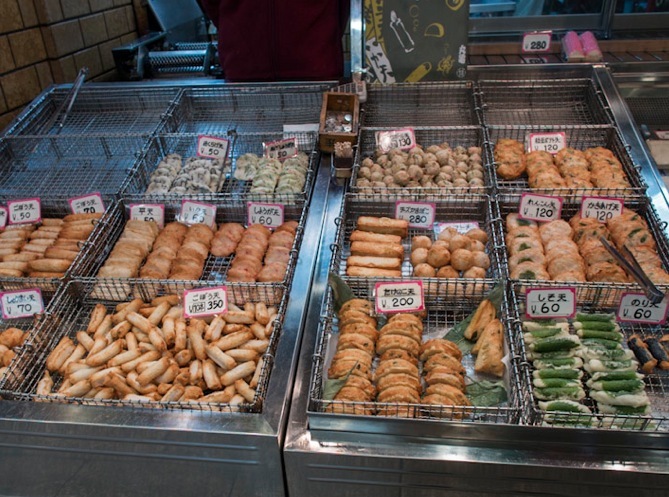 What surprised me the most at Nishiki Market was the sheer range of pickles. Given we only had been to Kyoto and Japan for a few days, I’ve not (yet) been aware pickles are part of the staple diet in Japan and you can eat it with almost everything and at every hour of the day. 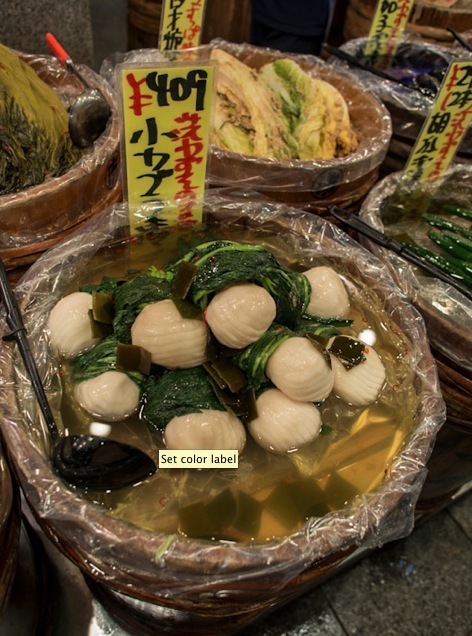 The pickles are called tsukemono and depending where they come from, they might be called kyo tsukemono or nara tsukemono. 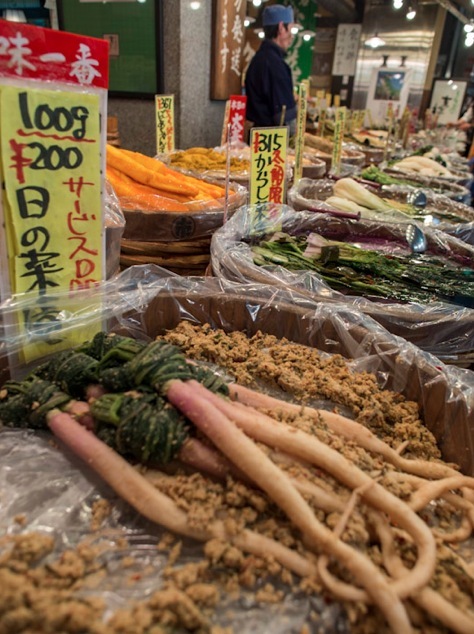 Many different types of vegetables are available, for example nukazuke are vegetables pickled in rice bran, misozuke are vegies pickled in miso for up to 2 years and shiozuke are simply pickled in salt. 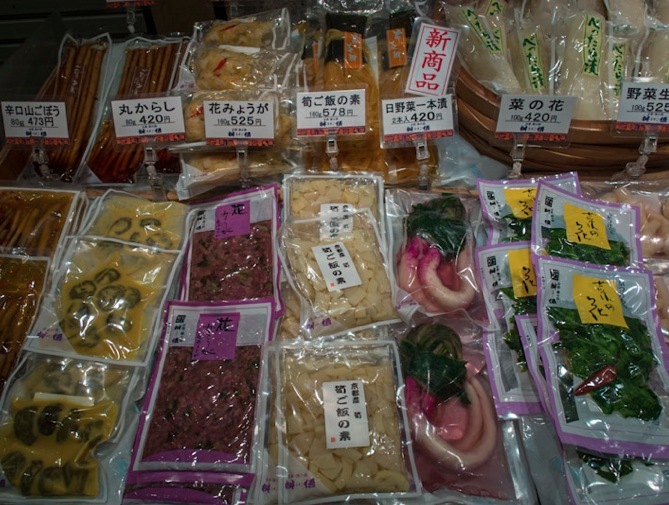 Pickles made in Kyoto are known for their exquisite flavour. Using simple ingredients and methods they highlight the best local produce of the season. 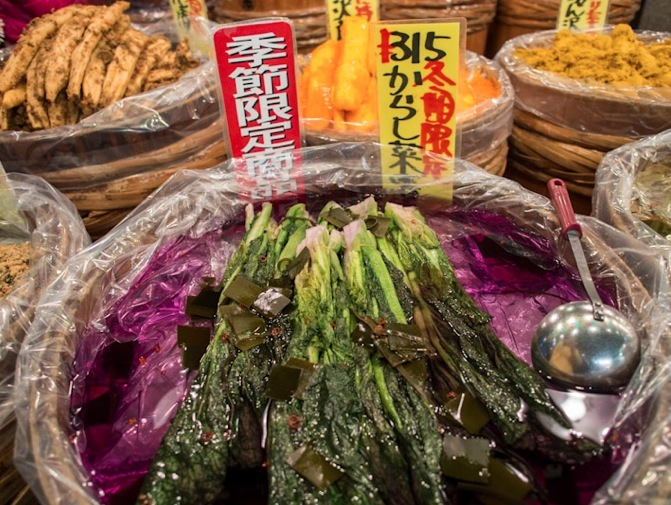 When biting into a piece of Kyoto tsukemono, you’ll find the flavor and texture of the vegetable enhanced, and not overpowered, by the pickling. The bright colors are also natural, as no artificial colorings are used. The variety, of course, depends on the season: Spring brings leafy vegetables such as mizuna (a thin leaf vegetable), while summer features eggplant, autumn, pumpkin and winter turnip cut into paper-thin slices. 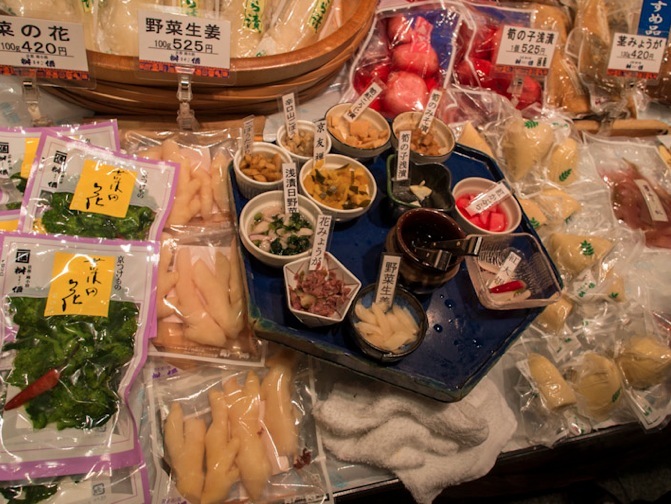 Not just at the shops at the Nishiki Market, but actually at all the tsukemono shops we say, can you try the different pickles and take them home with you. Gift packages are also readily available, composed of the most popular choices.